The PhD student Alejandro Suárez Mascareño, of the Instituto de Astrofísica de Canarias (IAC) and the University of La Laguna (ULL), and his thesis directors at the IAC Rafael Rebolo and Jonay Isaí González Hernández have discovered a “super-Earth” type planet, GJ 536 b, whose mass is around 5.4 Earth masses, in orbit around a nearby very bright star. The study has been accepted for publication in the specialized journal Astronomy & Astrophysics; researchers from several countries are involved. This exoplanet –the planet orbiting the star GJ 536- is not within the star’s habitable zone, but its short orbital period of 8.7 days and the luminosity of its star, a red dwarf which is quite cool and near to our Sun, make it an attractive candidate for investigating its atmospheric composition. During this research a cycle of magnetic activity similar to that of the Sun has been found, but with a shorter period, 3 years. “So far the only planet we have found is GJ 536 b but we are continuing to monitor the star to see if we can find other companions”, says Alejandro Suárez Mascareño, who is the first author on the article. “Rocky planets are usually found in groups”, he explains, “especially round stars of this type, and we are pretty sure that we can find other low mass planets (other “super-Earths”) on orbits further from the star, with periods from 100 days up to a few years. We are preparing as program of monitoring for transits of this new exoplanet to determine its radius and mean density”. “This rocky exoplanet is orbiting a star much smaller and cooler than the Sun” comments Jonay Isaí González, “but, sufficiently nearby and bright. It is also observable from both the northern and southern hemispheres, so that it is a very interesting for future high stability spectrographs and in particular for the possible detection of another rocky planet in the habitability zone of the star”. “To detect the planet”, states Rafael Rebolo “we had to measure the velocity of the star with an accuracy of the order of a meter per second. With the construction of the new instrument ESPRESSO, co-directed by the IAC, we will improve this accuracy by a factor of ten, and will be able to extend our search to planets with conditions very similar to Earth, around this and many other nearby stars”. 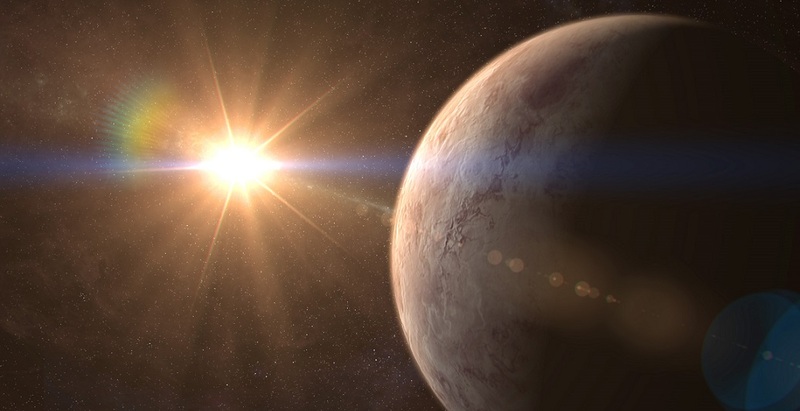 This planet was discovered during the preparation of the doctoral thesis of Alejandro Suárez Mascareño, within the programme of Training of Research Personnel of the Ministry of Economy, Industry, and Competitivity (MINECO).